Chicagoans have been pushing for years for a vibrant food truck community similar to those in New York and L.A.
Students returning to campus this fall may have been surprised when numerous food trucks began parking outside of the Reg and the bookstore near lunchtime. The trucks seemed to have appeared out of nowhere—one moment they were there, the next moment they were gone. But the surprise was a welcome one—Chicagoans have been pushing for years for a vibrant food truck community similar to those in New York and L.A. The fight for food trucks has been long and arduous. Despite popular support, current legislation for food trucks hinders their ability to operate and thrive. Chicago’s “Mobile Food Dispenser” laws require, among other stipulations, that all food sold from trucks must be “totally enclosed in a wrapper or container” and must have been “manufactured, prepared or wrapped in a food establishment licensed by the city or a food establishment.” Stops on any one block cannot exceed a duration of two hours or be within 200 feet of any principal entrance to street-level brick-and-mortar restaurants, and no sales can be made between the hours of 10 p.m. and 10 a.m.
Then there’s that other setback very particular to Chicago: the winter. The winter season is notoriously difficult for food trucks in other cities; after all, the entire business model of a food truck relies on mobility, and mobility is subject to nature’s oft-brutal caprices. But in a city notorious for its wind, snow, and incredibly low temperatures, Chicago food trucks must either brave the long winters or be out of business for nearly a third of the year. Though the Slide Ride now pays the bills, Rodriguez describes the process of starting a food truck business as “long and difficult.” But she stuck with it—she knew it was the right business for her. The whole procedure, from the conception of the Slide Ride to its realization, took about a year. So what exactly is in a year? To start, research—lots of it. Before hitting the streets, entrepreneurs interested in getting into the food truck business must develop a concept that is attractive to prospective customers and assess its financial feasibility. After the concept is established and the budget drafted, it’s necessary to develop and test a menu, buy a truck, renovate the truck to house all the necessary equipment, design a logo and wrap the truck, find a kitchen space, and get licensing for both the kitchen and the truck. But the work doesn’t stop there: A good concept in itself is not enough to get customers lining up at your truck. Establishing a strong online network using social media tools like Facebook and Twitter is vital to visibility and success. Twitter in particular is indispensable to the day-to-day operations of a food truck. A mobile food vendor is by definition often on the move, and customers need a convenient way to know when and where to find the truck. Twitter allows truck drivers to post their schedule and menu online to anyone interested. But there are many potential patrons who do not use Twitter, so maintaining a website that includes the truck’s menu, schedule, and contact information is also necessary. After all of those tasks are completed, the truck can finally be tested on the streets. Typically, a regular schedule with reliable locations is established to minimize unexpected problems related to parking and to create a loyal customer base that knows where to find the truck on any given day. For Rodriguez, a typical day begins around 6 a.m., when the ingredients are delivered to a bar whose kitchen space she rents for the morning. Everything must be prepped and cooked early, as all the food must be packaged before being put on the truck. Depending on where in the city the truck is planning to go that day, Rodriguez and company will go out early in the morning to seek out viable parking spots. Around 9:30 or 10 a.m., the Slide Ride team begins to take the food out of the oven to load onto the truck and to prep for the day’s run. The food is placed in two hot boxes—reaching upward of 200 degrees—which are run by a single generator. Drinks and cold sauces are placed in the truck’s cooler. Weather permitting, the truck is out on the streets by 11 a.m.; lunch runs span between 11 and 1:30. A couple nights a week, the Slide Ride can be caught on night runs, which usually occur around 4:30 or 5 a.m. But the day-to-day operations of the Slide Ride and other trucks will change significantly if a new food truck ordinance is passed. “One of the things in the [new] ordinance is that we can be closer to restaurants—100 feet away—if the restaurant is not serving a similar product, so that would help us with where we can park,” Rodriguez said. Many food truck operators have also lamented the ban on cooking on-board, which limits offerings to food and drinks whose ingredients won’t fall apart over a long period of time. However, Rodriguez has tailored her routine to the limitations of the current ordinance. Proposed in 2010, the bill to introduce a new food truck ordinance that gives trucks more freedom of movement, as well as the ability to cook on-board, garnered massive support last May. But as of today, it remains stuck in two council committees. Some food truck owners, including Rodriguez, are not optimistic. “I don’t see any movement on it going forward. I don’t have any hope that it’s going to change anytime soon. The alderman that is running the committee owns a restaurant,” said Rodriguez. A point of contention for food truck owners is the clout of a well-known restaurateur, 44th Ward Alderman Tom Tunney, who serves on one of the committees delaying the passage of the ordinance. Tunney, who chairs the City Council Committee for Economic, Capital and Development, is the owner of Ann Sather’s restaurant, which has four different locations in Chicago. 37th Ward Alderman Emma Mitts is chairman of the Committee on License and Consumer Protection, the other committee holding the ordinance back. Over $50,000 have been raised since 2010 for the two aldermen by trade groups representing restaurateurs and merchants. 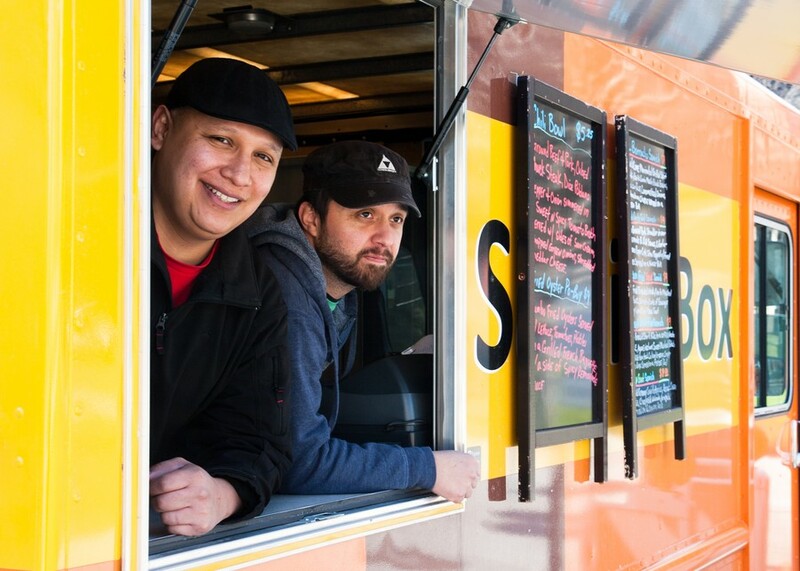 The future for food trucks is not quite as rosy as it initially appeared. Rodriguez does not believe that operating a food truck is a viable long-term business in Chicago. But regardless of the harsh legal environment in Chicago, new trucks continue to pop up—and for now, the Slide Ride and others ride on, buoyed by a shared sense of purpose. In spite of all the bumps in the road, Rodriguez insists that it’s been a wonderful experience. “It’s a really tight-knit community that works together a lot—it’d just be nice if some of the laws could ease up a little and let us operate and serve customers that want to eat our food,” she said.